Supporting large database workloads used to require large numbers of high-end servers and storage arrays. Now, with Oracle's new Exadata Database Machine X4-8, workloads that previously required dozens of racks of equipment can run dramatically faster on a single engineered system. 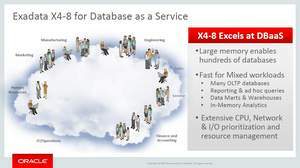 Exadata Database Machine X4-8 has been enhanced with increased compute, memory, and communication to provide an ideal platform for customers' most critical data-intensive operations, including data warehousing, OLTP, and big data analytics. The new engineered system is specifically optimized for DBaaS and in-memory database. Optimized for Oracle Database In-Memory, Exadata Database Machine X4-8 supports in-memory processing with massive DRAM capacity, together with transparent data tiering to flash and disk for less performance-critical data. Exadata Database Machine X4-8 supports Oracle Database In-Memory fault tolerance, allowing in-memory processing to continue without interruption, even when a database node fails. Exadata Database Machine X4-8 further reduces the operational and management costs in large private and public cloud deployments of Oracle Database, enabling large-scale DBaaS or consolidation initiatives within the enterprise. For the database compute nodes, Exadata Database Machine X4-8 uses the Intel® Xeon® E7-8895 v2, an optimized 15-core microprocessor that elastically scales frequency and number of active cores to help deliver peak workload performance. Exadata Database Machine X4-8 hardware is compatible and interoperable with previously released Oracle Exadata Database Machines, enabling customers with existing systems to easily expand with the newest system. Additionally, the new Oracle Exadata software supports previous-generation Oracle Exadata hardware systems and also supports both Oracle Database 12c and Oracle Database 11g Release 2. Oracle designs engineered systems to reduce the cost and complexity of IT infrastructure by optimizing performance at every layer of the stack. Thousands of customers worldwide rely on Oracle Exadata to simplify data center operations, drive down costs, and accelerate business innovation. "Since Oracle Exadata Database Machine was introduced in 2008, Oracle has been delivering industry-leading engineered systems that help our customers attain the most value from their enterprise data," said Juan Loaiza, Senior Vice President, Systems Technology, Oracle. 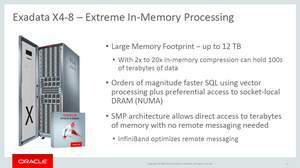 "Exadata Database Machine X4-8 again raises the bar and provides an ideal platform for Oracle Database In-Memory. Together, the combination enables customers to evolve into real-time enterprises." "The massive influx of data and the need to respond immediately to changing business conditions require IT to take a new approach to their data infrastructure," said Diane Bryant, Senior Vice President and General Manager of Intel's Data Center Group. "This customized version of the Intel Xeon processor E7 v2, developed in collaboration with Oracle, helps maximize the power of the Exadata Database Machine X4-8 by elastically accelerating peak performance of database operations, while also reducing the data footprint."